Two Bathers - Unique cast in bronze. Conceived in 1934 cast in 1949. Provenance : Eugene Rosenberg purchased directly from the artist in Prague in 1936 as a plaster and cast in bronze after the war in 1949, the plaster is now in the collection of Tate Britain. This bronze remained in the Rosenberg collection until 2014. Lit: John I. H. Baur in Exhibition Catalogue, Bernard Reder, Whitney Museum New York 1961, (pewter cast shown) cat no. 29 illustrated. Reder studied at the Academy of Fine Art in Prague from 1930, he had his first solo show in 1935. It was hughly successful and almost a sellout, and it was widely reviewed internationally. 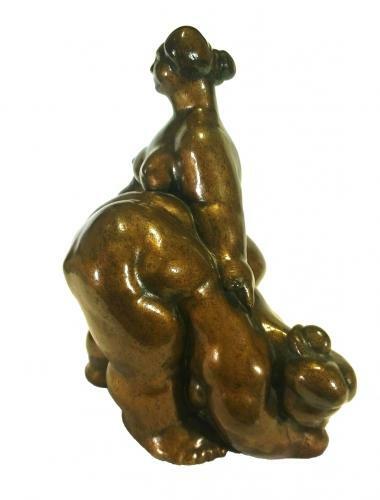 He went to Paris in 1937 and became good friends with the sculptor Maillol. In 1940 he exhibited with the Wildenstein Gallery. Maillol helped him gain a passage to Spain to escape the Nazi's but he was imprisoned with his family for illegal entry. The family eventually made it to Havana, Cuba before making the journey to New York in 1943. In Paris the Nazi's destroyed his studio and all his plaster works. Reder became an American citizen in 1948. Reder had a very successful career in America, he regularly showed at the Whitney Museum and his work was acquired by many museums and collections including, MOMA, National Gallery of Art Washington, Hirshorn Collection, Whitney Museum, and Tate Britain. In 1961 Reder was given a retrospective at the Whitney Museum covering three floors, unprecedented for any artist. Reder died in New York in 1963. The Two Bathers is a rare early work originally made in plaster to later be cast in bronze, due to the turbulent times in central Europe during WWII this was not always easy to achieve, a pewter cast of the same subject exists in an American collection. The following is from the Tate Gallery acquisitions statement 1978. The rounded, full forms and compact grouping accord with Reder's preoccupation with the importance of volume and ‘all-sidedness’. ‘Objects in nature are volumetric, all-sided,’ he wrote; ‘therefore axiomatic, not theoretical. All views of volumetric sculpture and all approaches to it - from around, above, below - are of the same importance. They have the axiomatic value of the sphere and require no theoretical explanations. In the volumetric approach to sculpture, none of its views can escape the control of the sculptor, the observance of the spectator.’ (From a statement published in the Whitney Museum catalogue, p.7). The original owner,architect Eugene Rosenberg (1907-1992) studied at the Academy of Fine Art in Prague at the same time as Reder, the plaster was purchased in 1936 two years after Rosenberg set up his practice in 1934. On the outbreak of war Rosenberg came to Britain, the bronze was cast in 1949, there are no other bronze casts of this subject. Rosenberg was a leading exponent of modernist architecture and commissioned artists such as Henry Moore, Naum Gabo and William Scott to make site specific works. He and his wife amassed a fine collection of British modern and international art during his career.